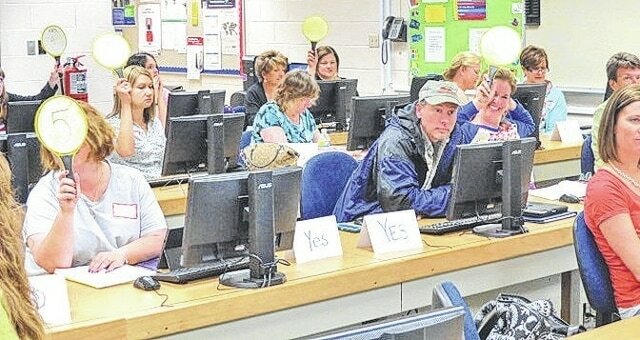 Area teachers participate in workshop offering students opportunities to respond during classroom instruction. Just days after students celebrated the last day of school, teachers, paraprofessionals, and administrators from Adams, Brown, Clinton, Fayette, and Highland counties began preparing for the 2015-16 school year by attending workshops during the Summer Learning Academy held June 8-11 on the campus of the Southern State Community College in Hillsboro. Sponsored by the Brown County Educational Service Center, Region 14 State Support Team, and Southern Ohio Educational Service Center, the Summer Learning Academy offered 49 full or half-day sessions tailored to grade-level needs in the areas of curriculum and instruction and professional development. Educators participated in workshops that offered new ideas and resources to empower students in Making Math Talk Outside the Box, to nurture writers of all ages, and to differentiate instruction by using Gamification (the layering of games into the learning process) and Classcraft (educational role playing) as a means to supplement classroom learning. Other workshops offered educators the latest tips for integrating technology into classroom instruction and how to use Twitter to enhance their personal learning community (PLC). By developing a PLC, educators can share expertise and work collaboratively to improve teaching skills and the academic performance of students. There were also workshops in classroom management, the use of assessments, incentives, and behavior motivation and modification – all of which are valuable resources teachers use in their classrooms on a daily basis. While classrooms may be void of students during the summer months, educators keep busy preparing for that day in August when their classrooms will once again be filled with the sights and sounds of young minds investing in their education and preparing for their futures. Information for this article was provided by Diana Miller, who coordinates communications for several area schools.